A VERY PARTICULAR DARKNESS envelops Guinsa at night. Arriving after sunset, I was met by the few dozen parked cars surrounded by something smaller than a village—a smattering of homes and restaurants, maybe 30 in all, mostly closed up by 8 p.m. 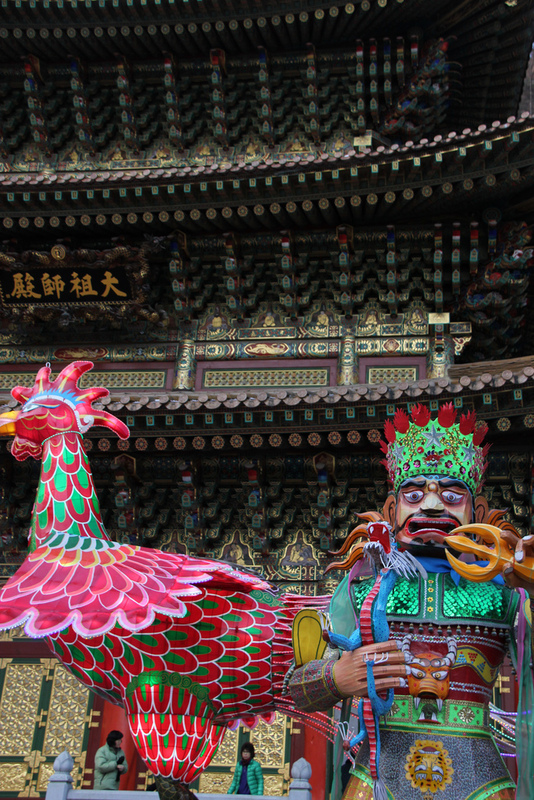 The temple complex itself lies one kilometer uphill, wedged within a valley surrounded by mountains on the eastern border of North Chungcheong, the landlocked province. To find it, one must drive to the end of Guinsa Road, a dangerously narrow pavement that snakes along the side of a cliff from Highway 595, at least 30 minutes from any reasonably populated town. All this is to say that there is not very much light in the neighbourhood after sunset, from either the road or faraway homes or distant highway; with the sun disappeared, the only illumination came from the few dim street lamps strewn across the parking lot. The sleepy mini-town has already tucked into bed. I slept in the spare room of a bungalow rented out by a quiet elderly couple who were watching TV long after I went to sleep and well before I awoke at 7:30 Sunday morning. There’s no real way-finding signage, even in Korean language, but there were hordes of middle-aged and elderly natives to follow, so follow I did, for maybe 20 minutes. When we reached the entrance of Guinsa, the Four Heavenly Kings Gate, some paused to bow. We passed the next gate, the first building, the administrative hall… We continued for so long that it became quickly and embarrassingly evident to me that this lonesome temple complex was easily as intricate as the trickle of homes below, overflowing with gardens and statues and ornamental buildings—and, inexplicably, thousands of Koreans. It became quickly and embarrassingly evident to me that this lonesome temple complex was easily as intricate as the trickle of homes below, overflowing with gardens and statues and ornamental buildings—and, inexplicably, thousands of Koreans. Here’s what I knew going in: that Guinsa, created relatively recently in 1945, headquarters the distinctly Korean sect of Cheontae Buddhism and its roughly two million followers; that the temples are uniquely tall due to their mountainous surroundings; and that, without a car, the easiest way to reach Guinsa is via trans-city bus from the nearest towns of Jecheon (~30km away) or Danyang (~15km). 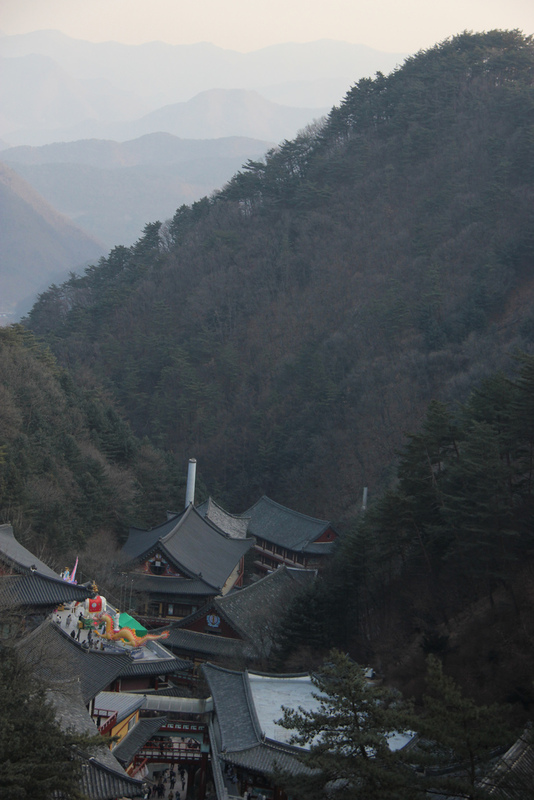 More importantly, however, here’s what I did not know: the Sunday I visited, January 29, 2012, happened to be the first Sunday after the Lunar New Year, i.e., one of Cheontae Buddhism’s most celebrated and holiest days. This accounted for the unexpected 8,000 people scurrying throughout the area that weekend, among whom I was almost certainly and accidentally the only Westerner. A sweet-faced girl in her 20s, employed in the administrative building, clarified for me the specialness of the weekend. 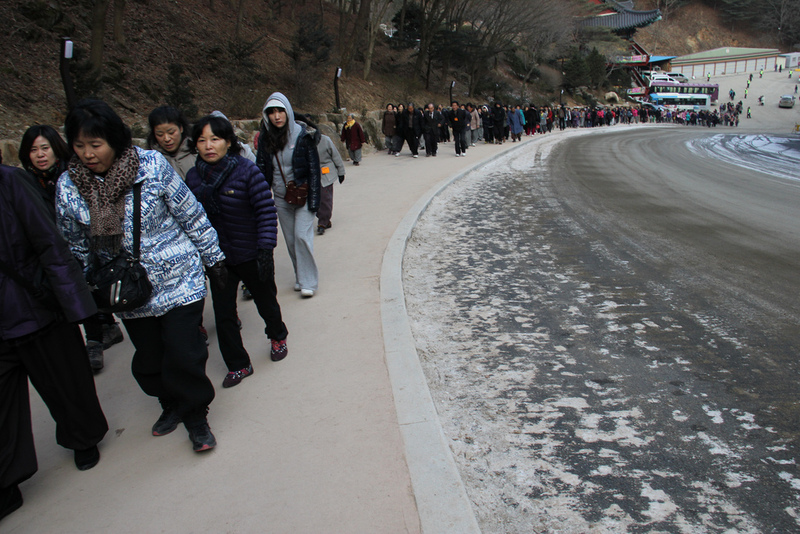 In the days following Lunar New Year, she said, thousands of Korean families drive up to the temple complex to pray for the year to come, some staying as long as four or five days. Most sleep in the general lodge area (a wide jjimjilbang-like floor in the Cafeteria Hall building) and eat generic meals of rice, kimchi and soup served free of charge. There are well-worn hiking paths through the mountains, but most come just to meditate and pray. “Do they pray all day?” I asked, incredulous. It’s worth clarifying that most families don’t stay longer than 24 hours. And some, like 27-year-old Hyeong-yeon, come less for the religious enlightenment than for the simple peace of mind. A soft-spoken physical therapist with braces whose English is barely better than my Korean (read: bad), I met Hyeong-yeon on the bus back that afternoon; he explained that he used to visit with his family every year since he was a child. After he moved out of his parents’ house five years ago, he began, partly at his mother’s behest and partly out of sentimentality, making annual solo pilgrimages to the temple during the New Year. Now he finds it one of the only places in Korea where he can escape the troubles of being a single 27-year-old man and absorb himself in real, palpable peace. It’s no wonder why. That morning I’d trekked past the parka-clad ajummas huddling around the instant coffee vending machines and hordes of shoes respectfully removed at the door to each building, and reached the Great Teacher Hall, Guinsa’s modest peak. To look down at the Korean landscape for the first time from there, one would be convinced it’s nothing but mountains. The sound of monks’ praying, chanting, banging is inescapable—it echoes through the valley below, mingling with bird songs through unpolluted air against the early morning coral sky. I try not to romanticize stuff like this, but it was a goddamn romantic moment, and you don’t need to be a Cheontae Buddhist to have felt it. This article originally appeared in Busan Haps’ July / August print edition.